Pope John Paul II has returned to the Rome hospital where he was treated earlier this month for flu-related breathing problems. 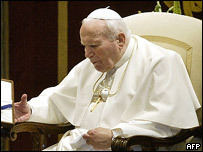 The Vatican said he suffered a relapse of his flu condition. Reports say doctors are discussing whether to carry out surgery to help ease pressure on his inflamed windpipe. The 84-year-old Pope spent 10 days in the Gemelli Hospital earlier this month suffering throat spasms brought on by the flu. He went home on 10 February. The Pope seemed to have been recovering well, appearing twice at his Vatican study window to greet pilgrims. Vatican spokesman Joaquin Navarro-Valls said the Pope had suffered a return of flu symptoms on Wednesday afternoon and was admitted to hospital for further specialist treatment and checks on Thursday morning. Italian media reports say doctors are considering performing a tracheotomy, where a small opening is cut into the neck and the windpipe so air can directly flow into the lungs. An official medical bulletin on his condition is not expected until Friday. Italian news agency Ansa said the Pope was conscious as he arrived at hospital. He is reported to have breathing difficulties and a fever.